Polyethylene can be referred to as either Low-density Polyethylene, often abbreviated as LDPE, or High-density polyethylene, often abbreviated as HDPE. Both grades are a part of the thermoplastic family, meaning that it can be melted to a liquid and remolded as it returns to a solid state. Polyethylene is a low cost, chemically resistant plastic material that can be used for a wide variety of applications. The versatility of polyethylene has made it one of the world's most popular plastics. 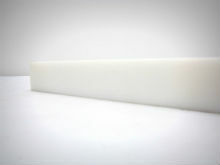 Polyethylene is available in a number of grades according to its molecular weight. Machining Polyethylene L/D-H/D to close tolerances is easily obtained through Vanderveer Industrial Plastics' state-of-the-art CNC machining facility. Vanderveer stocks polyethylene rods, sheets and tubes and then fabricates them to your standards. Low-density polyethylene has excellent corrosion resistance and is susceptible to stress cracking when exposed to ultraviolet. In the polyethylene family, it is a cheaper alternative than its counterpart High-density polyethylene. High-density polyethylene is more rigid than its low-density counterpart, with a density value that ranges from 0.935 to 0.96 g/cm³ and above. HDPE (high density polyethylene) is available as sheet or rod stock for applications that require greater strength & stiffness than LDPE. 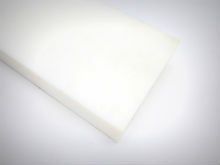 HDPE with an embossed surface is widely used as a cutting board material in restaurants and food processing plants. HDPE is easy to weld using thermoplastic welding equipment and is an excellent choice for fabricated water tanks and chemical tanks that must be assembled by thermoplastic welding. Several grades of Polyethylene are available. For additional information on Polyethylene plastic materials, contact your local Vanderveer Industrial Plastics representative or call Vanderveer Industrial Plastics at 714.579.7700.